Do animals have souls? I had to think very hard. "Si, creo que si, porque..."
Not your typical Spanish class topic, but this was not your typical Spanish class. My teacher and I sat at a table on a rooftop terrace, looking out over the city of Quetzaltenango, Guatemala. At the next table, another pair were talking about recipes. It amazed me that this was only my second week of study. I had come to Guatemala at the beginning of my Central American travels, equipped with the rustiest of college Spanish and a hunger to communicate. I had plenty of company. Guatemala's scores of Spanish language schools, some of the best and most inexpensive anywhere, draw students from around the world. Given the town's allure, it's not surprising that over 12,000 foreigners study there annually. It seems like every third building is another language school. One Saturday afternoon, I strolled into the office of one of the oldest, Academia de Espanol Guatemala, and on Monday morning, I began classes. 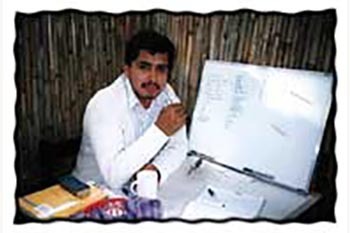 My teacher, Juan Cecilio, was incredibly patient with my fumbling Spanish. Seeing that I had largely forgotten the basics, he quick-marched me through a review of Spanish grammar, in only five days-- without a textbook! By the end of the week, we were talking (slowly) about Guatemalan politics and the upcoming election. Most students choose homestay accommodation, but the families are not exactly a typical cross-section of Guatemalan society. Our kindly hosts, Luis and Angelina, owned a six-bedroom villa with courtyards and fountains, paid for by 14 years' hard work in the US (he started out as a gardener, she as a maid). Dinners with them were both an opportunity and an incentive to improve my Spanish, and I learned about facets of the town invisible to the casual tourist. Lovely, picturesque Antigua, they said, had become far too pricey for middle-class locals, who were being forced out to distant villages. Quetzaltenango was a complete contrast. Usually called by its local name, Xela (shay-la), the country's second city is gritty and down-to-earth, without the museum-like quality of Antigua. It's a fairly prosperous commercial center, filled with people simply going about their lives. Many Spanish schools there have a strong social emphasis, sponsoring community projects such as schools and clinics in the surrounding Mayan villages. Casa Xelaju, where I studied, runs literacy programs in the settlement of La Pedrera, and students are enthusiastically encouraged to volunteer. But the real joy of one-to-one teaching is that the daily "lesson" can be anything you make it. One day, another student and I set out with our teachers to visit the Mayan market in the nearby town of San Francisco El Alto. Together, the four of us asked questions and learned about the uses of the medicinal plants on sale, the meanings of the complex weaving designs. Xela's schools use the same weekly format as in Antigua, though tuition is slightly lower. Because the city has few tourist attractions, schools there offer a wider variety of activities and excursions. My school had an amazing afternoon program seven days a week including everything from Mayan weaving lessons to visiting the local prison. Though students often stay several months, constant turnover means every Friday afternoon is "graduation day," with a party and a cake. On the day I left Xela, several long-term students gave tearful goodbye speeches, telling moving stories of their volunteer work with village kids and their meetings with courageous Mayan activists. I felt a bit foolish merely thanking my teachers for helping me to put my thoughts into Spanish words-- but in the back of my mind, I was already planning how to come back, and really learn. Check the school's credentials. How long has it been in operation? Is it accredited by the Ministry of Education? Ask about teachers' qualifications. How many years' teaching experience do they have, on average? How many have university degrees? Seek out a school that treats teachers well (particularly giving long-term contracts instead of hiring week-to-week). Like many developing countries, Guatemala has a surplus of educated people who compete for limited jobs, forcing salaries down and eroding working conditions. Injustice aside, you are not likely to learn much from an angry, exploited teacher. Go for quality, not quantity. 4-5 hours of Spanish lessons per day is as much as most people can absorb. Further hours are often a waste of time and money. Don't base decisions solely on other travelers' recommendations, since so much depends on the individual teacher. Even a bad school has a few good teachers, and vice versa. Finally, if you have special needs or interests, bring materials with you. Imported books are scarce and expensive, but most teachers are happy to work with any textbook or topic that you supply.